Tropic Snow Dumb Cane (Dieffenbachia amoena 'Tropic Snow') is one of the largest and most beautiful of the dieffenbachia plants. The stalks resemble canes with large, oblong green leaves that are variegated with white or cream. This robust plant is native to Brazil and can grow up to 6 feet or more. 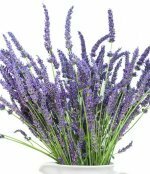 Place it in a large container and make a bold, decorative impact. This popular ornamental houseplant contains a sap that contains calcium oxalate crystals. If plant is eaten or chewed, can cause an intense burning and inflammation of the mouth, throat, and tongue. When this happens, the throat swells and closes the vocal cords, resulting in temporary speech loss. This is how the dieffenbachia plant got the common name "dumb cane." 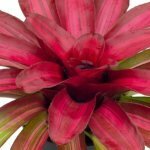 This plant is not only a wonderful decorative accent, but it is a natural air cleaner. It helps to keep the air inside your house cleaner, removing pollutants from the air. Light: Bright but filtered or diffused sunlight is sufficient to ensure healthy growth of this plant (near bright east or south window). Water: Water regularly and thoroughly because infrequent watering can cause leaves of your dieffenbachia to become brown and unattractive. Water, then allow the soil to drain and empty excess water. This is necessary to prevent root rot. A well-draining potting mixture should be used. Let the soil dry out to about an inch down before you water again. Drooping yellow leaves may be a sign of overwatering. Temperature: The ideal temperature range for growing a Tropic Snow Dumb Cane is 70 to 80 degree. Fahrenheit during the day, and 60 to 65 degree at night. Plant can tolerate 50 degrees Fahrenheit without damage but avoid cold drafts. If plants becomes too cold, the leaves will turn yellow and droop. Fertilizer: Fertilize with a multipurpose fertilizer at every other watering when the plant is actively growing. Plant goes dormant in the winter. Do not feed at all. Humidity: This plant likes humidity. You can provide this with a room humidifier, humidity tray, or by misting. Propagate: You can propagate by tip cuttings of 12 inches or by stem segments. Cut the stem into 3 inch segments and lay them on their side, placing them halfway in the soil, and new plants will grow from the stem. 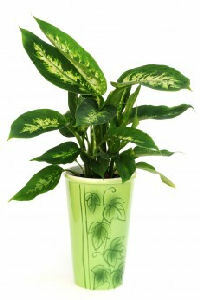 Repot: If dumb cane houseplant grows too tall, repot in a larger container ane use a well-aerated potting mix. Pest: Plant can be attacked by spider mites and mealybugs. Check for mealybugs at leaf nodes and axils and for spider mites on the undersides of leaves. A magnifying glass will enable you to see the mites. Spider mites will show stippling of the leaves and webbing. Mealybugs will cause a cottony white substance to form in the leaf nodes and axils. If your plant has these symptoms, spray with appropriate pesticide. however, it is toxic and must not be eaten or chewed on. Please keep out of reach of children and pets. 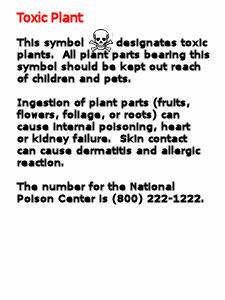 Avoid contact with the eyes, and always wash skin thoroughly if it comes in contact with the sap from the plant. If someone has swallowed Dumb Cane leaves or any other part, call 911 instantly.